First off, everything I’m telling you can be easily found by reading through our FAQ’s and Technical Specs pages. 1. Standard Comic: 7 x 10.5 inches. Let’s say your comic page/file is only 6×9, we still need the file you send us to be 7 x 10.5 inches, unless you’re doing a custom sized book. All you need to do is to place your file on a 7 x 10.5 canvas and fill the rest with white, a color of your choice, or whatever you like; just as long as the final file size you send us is 7 x 10.5 inches. 2. Manga Comic: 5.5 x 7.75 inches. The same rule applies here as above. If your comic page is smaller than 5.5 x 7.75 inches, we still need the final file that you send us to be 5.5 x 7.75 inches. OK, armed with the above info, let’s jump into the templates! Yay! Back in the Ka-Blam Bunker we get a lot of questions concerning our templates. They’re pretty self-explanatory but, if you’re a visual type of person, like myself, you may find this very useful. I’ve given this link to several creators whom have found it very helpful so I thought that I should share this with everyone, again. 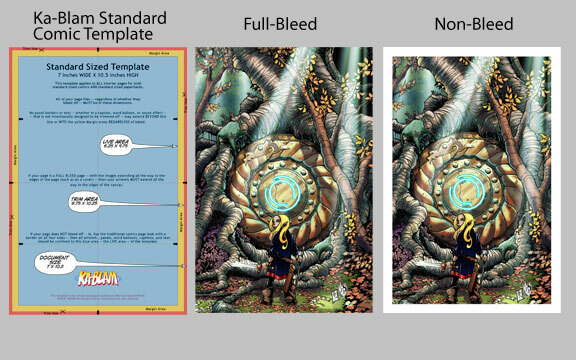 Ladies and Gentlemen…The Ka-Blam Template Visual Guide! Check it out, give it a look…I’ll wait. So now that leads me into our most frequent and biggest obstacle course which most people seem to have a difficult time navigating…the bleed. Now armed with all the information above, this should be a pretty easy explanation. TO BLEED OR NOT TO BLEED! If you want the images/pages of your final printed comic to cover the entire page; I’m talking no borders just a whole image of Capt. Underpants crashing through a wall, then you need your image to cover the entire template. If you’re doing a standard size comic, then Capt Underpants needs to be covering the entire 7 x 10.5 inch template. If you’re doing a manga comic then Cap needs to fill the entire 5.5 x 7.75 inch template. Yes, that includes the yellow and scary red area of the template. The whole thing! You shouldn’t see any white border in your final file. It should only be Capt. Underpants in all his wall-busting 7 x 10.5 inch glory. That, my friends, is full bleed. Now one important note here; if you have Capt. Underpants saying something prolific as he crashes through the wall, make sure that his prolific utterance is sitting safely in the blue area of the template. We will trim away the red area of the template and having something in the yellow area might risk getting lost as well. You can afford to lose a few flying bricks but, Capt. 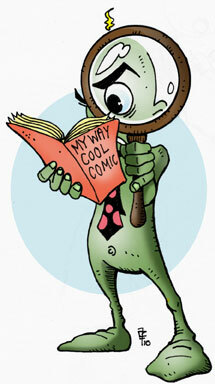 Underpants’ awesome word balloon is important, so keep it safe…keep it in the blue. At this point, this may be a bit redundant and if you think it is…then congrats, you got it! If you want your image to sit nicely in the middle of the page with a nice border around it, (just like those old Steve Ditko Spiderman comics) then place it in the middle of our template in the safe, blue area and fill the remainder of the template up with white or whichever color you like. In the end, you’re still sending us a 7 x 10.5 inch file/page. As I mentioned at the outset, all this can be found by reading through our Technical Specs and FAQ’s pages. There’s also a search feature where you can find lots of info as well as some very cool articles and info found by clicking through our Resources page. Now get back to making some comics! PreviousDirections to Ka-Blam for Megacon Pickup!